I wanted to do at least one treat this year that was not candy! 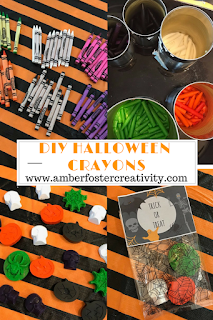 These Halloween shaped crayons were my solution and turned out too cute! Start by taking all of the paper off of the crayons. The first time I did this I slit the paper on each and ever crayon with a razor blade and it took FOREVER and I hated every second of it! Then I did some research and found that if you soak the crayons in a bowl of warm water for a few minutes they literally unwrap themselves! Next put your tin cans in the skillet of your choice. Make sure you have a little bit of water in the bottom of the skillet. Not too much or the cans will float. Put your crayons into the cans and watch them melt. This part happens rather quickly. You may need to swirl the cans a bit to insure even melting. Be sure to wear a pot holder when handling the cans. They may be hot. Next is the really fun part. Pour your melted crayons into your molds. Some of my molds had some glitter stuck in them from who knows what and i really love how they turned out! I may sprinkle a little in the molds on purpose next time! I let them harden about 30 minutes, however you could pop them in the freezer for faster hardening. After they have hardened, gently pop them out. I then put 2-3 crayons in a sack and stapled on my cute little labels.